If you follow me on Instagram (@SummerGirlFitness) you would have seen on my stories that I was in VEGAS last weekend celebrating my little sister’s 21st birthday! 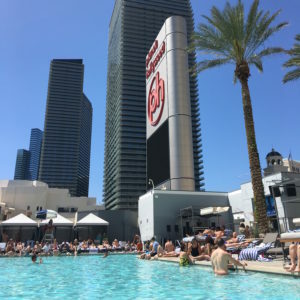 I got a number of messages from people asking about how to stay healthy on vacation or healthy vacation tips so this post is a combination of a recap of my trip, Vegas recommendations for anyone visiting soon, and top tips for staying ON TRACK while on vacation! First off I want to say that I believe a healthy lifestyle is all about balance, and balance definitely includes enjoying a vacation, having a cocktail here and there and not panicking if you have the occasional treat. The most important thing is to keep a healthy relationship with food and with yourself. That being said I definitely have some tips and tricks for being health conscious while enjoying a weekend away. 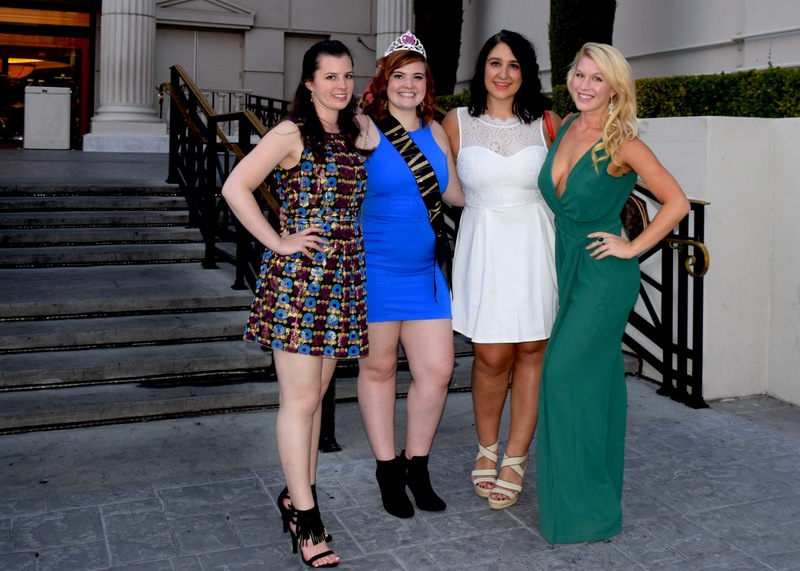 We were in Vegas Friday – Sunday so a quick trip, and it was for my little sister who was turning 21, one of my best friends Jenny and my older sister who is a lawyer. It was amazing to all getting together for such a special occasion, and I definitely did not want to miss out on a good time. We went to see the Britney Spears “Piece of Me” show which was (confession) actually my THIRD TIME seeing it….yes I am kind of Britney obsessed! This time though we all dressed up which made it even more fun. I made my Britney VMA’s outfit myself and although it took a TON of hours was totally worth it. If anyone is planning a Vegas trip before December I would definitely recommend seeing Britney because it was epic…all 3 times I went. When I travel I definitely love to enjoy a cocktail here and there but I stick to vodka club soda with a lime, champagne or the occasional skinny margarita. Vodka club soda is my go-to drink, and you can also ask for a splash of cranberry if you need a bit more flavor. Avoiding sugary juices or sodas saves a ton of calories and I also find I feel so much better the next morning if I stick to drinks without excess sugar. Also if you squeeze 1 or 2 limes in it it tastes delicious! 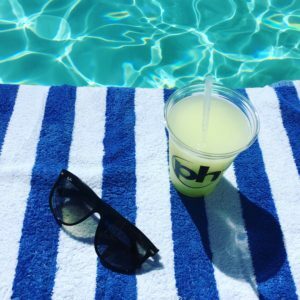 We went to the Wet Republic day club at the MGM Grand on Saturday, and I tried their Skinny Margarita which was actually really good. I would recommend trying that if you go! 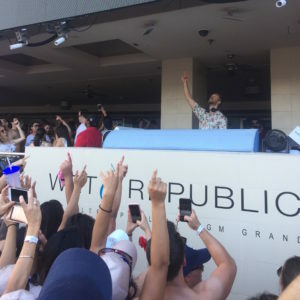 Also Calvin Harris was performing at Wet Republic so that was definitely a highlight. On vacation I like to choose one meal a day that is my “splurge” meal, and then eat simple and healthy for the other two. This helps stay on track for the most part and avoid over indulging at every meal! In Vegas we kept breakfast and lunch each day pretty simple, and then enjoyed dinner out. Our big, expensive meal out for the weekend was Nobu Friday night and it was TO DIE. I have wanted to go to Nobu for forever because Japanese food is my favorite, and it was actually a very heathy meal with mostly raw fish. The flavors were incredible and such a memorable experience. Pricey but worth it! On vacation I always make it a point to walk a TON which works out perfectly because inevitably you want to explore and want to walk around. I also usually bring workout clothes to squeeze in a quick workout at the hotel gym or in my hotel room whenever I have a free minute. Even just 15 minutes is better than nothing and can keep you on track and feeling good in your skin! When I am on vacation without equipment I love to do bodyweight circuit workouts that do not require much space. I select moves that I can do with where I am at and create a circuit doing each move for 1 minute. Overall Vegas was such a fun trip and we had the best time but also made healthy choices and I left feeling good, not guilty and ready to get back to regular meals and workouts Monday morning. 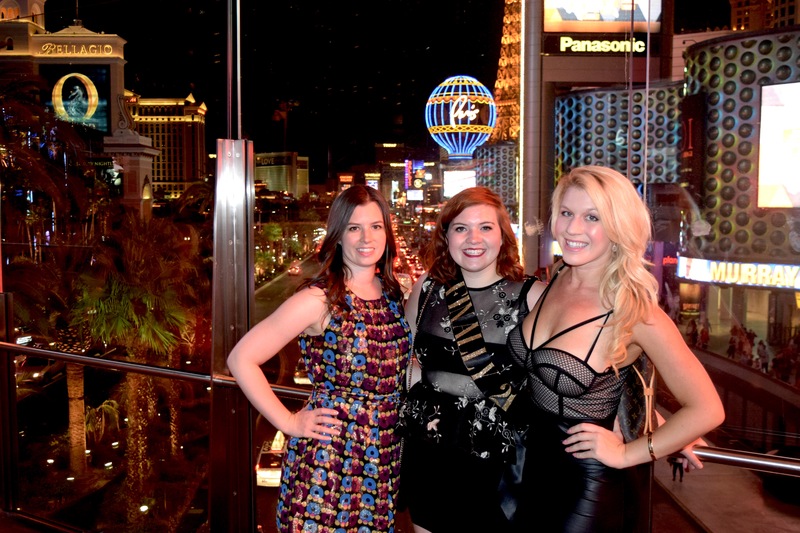 Friday night we went to the club Hyde and saw Zedd perform, and Saturday night after the Britney show we took it easy and went to my favorite place in Vegas the Chandelier Bar at the Cosmopolitan and had a glass of champage. My favorite parts of the weekend were definitely the day club at the MGM Grand. It was so fun to party without heels on and enjoy the sun and the water, and then of course the Britney concert, and the Nobu dinner. 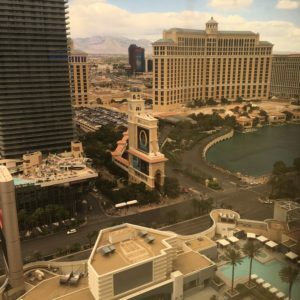 If you’ve been to Vegas let me know what recommendations you have for me the next time I go!